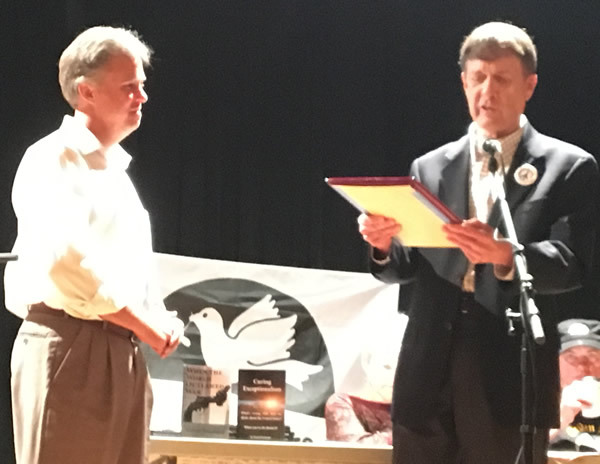 At the Veterans For Peace Convention in St. Paul, Minnesota, on August 26, 2018, the U.S. Peace Memorial Foundation awarded its 2018 Peace Prize to David Swanson, director of World BEYOND War. “We have a culture of war in the U.S. Americans who oppose a war are often labeled traitors, unpatriotic, un-American, and antimilitary. As you know, to work for peace you must be brave and make great personal sacrifices. “As a movement to change our war culture, the U.S. Peace Memorial Foundation recognizes and honors courageous Americans who stand for peace by publishing the US Peace Registry, planning for the US Peace Memorial as a national monument in Washington, D.C., and awarding an annual Peace Prize. “Previous Peace Prize recipients over the past ten years are the honorable Ann Wright, Veterans for Peace, Kathy Kelly, CODEPINK, Chelsea Manning, Medea Benjamin, Noam Chomsky, Dennis Kucinich, and Cindy Sheehan. 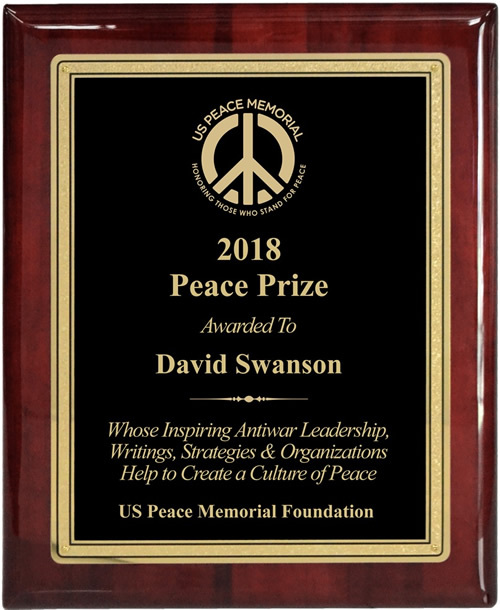 “I am very pleased to announce that our 2018 Peace Prize is awarded to the honorable David Swanson – For his inspiring antiwar leadership, writings, strategies, and organizations which help to create a culture of peace. David Swanson 2018 Whose Inspiring Antiwar Leadership, Writings, Strategies and Organizations Help to Create a Culture of Peace. The US Peace Memorial Foundation directs a nationwide effort to honor Americans who stand for peace by publishing the US Peace Registry, awarding an annual Peace Prize, and planning for the US Peace Memorial in Washington, DC. These projects help move the United States toward a culture of peace by honoring the millions of thoughtful and courageous Americans and U.S. organizations that have taken a public stand against one or more U.S. wars or who have devoted their time, energy, and other resources to finding peaceful solutions to international conflicts. We celebrate these role models to inspire other Americans to speak out against war and to work for peace. Our US Peace Registry recognizes heroes who have engaged in a broad range of peace and antiwar activities. Individuals who have written an antiwar letter to their representatives in Congress or to a newspaper are included, along with Americans who have devoted their lives to peace and opposing war. A US Peace Memorial in Washington, DC is our ultimate goal. Most monuments in our nation’s capital commemorate war. While soldiers are told that it is heroic to fight and die for their country, peace activists are often labeled “un-American,” “antimilitary,” or “unpatriotic.” This mentality has resulted in a country that recognizes contributions to war and the sacrifices of the military, but does not honor those who make valiant efforts to end war and maintain global peace. It is time to dedicate a National Monument to peace. Our society should be as proud of those who work for alternatives to war as it is of those who fight wars. Next PostNext Tomgram: Judith Coburn, Can We Be Forgotten Anymore?